Much of the KM open source methodology has its roots in a 2 million euro EC collaboritive research and development project conducted in 1998-2001 and subsequently applied and continuously improved by Knowledge Associates until December 2005.If you would like to read about the EC project, its work and findings, we recommend the following book, Knowledge Asset Management. Written by four highly experienced consultants in the field, including Ron Young, a founding partner of knowledge-management-online, the book also includes case studies showing how the principles work in practice. 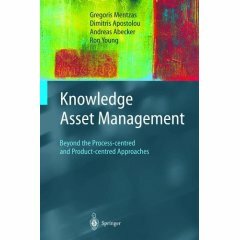 "One of the rare books today on Knowledge Management that addresses the leveraging of an organization's intellectual assets by using an integrative and holistic approach. Well worth reading!" "This book is a useful illustration of Knowledge Management implementation principles: it synthesizes theoretical and pragmatic approaches to the subject and does a competent job of embracing the various dimensions of a Knowledge Management initiative." "For those organisations who wish to take a strategic view of knowledge management, this book shows how they can take KM to the next level - not driven by a technology solution but based on the strategy and needs of the business." "This book outlines a conceptually rigorous yet pragmatic approach for managing knowledge assets in order to enable organizational growth, foster innovation and create responsiveness to market demands. The explicit development, nurturing and facilitation of knowledge assets presents tremendous opportunities for organizations of the future that will operate and thrive in the knowledge economy." Rosalie Zobel, Director, New Methods of Work and Electronic Commerce, Director-General Information Society, European Commission. "The KM method proposed in this book enables enterprises to exploit their knowledge more effectively by making it easily available to employees and by facilitating the exchange and integration of information used by knowledge workers in a variety of business situations"
Ciro Maddaloni, SOGEI S.p.A., Gruppo Telecom Italia. There are two main approaches to knowledge management (KM), the process-centred approach which treats KM as an interpersonal communication process and the product-centred approach which focuses on the artefacts for knowledge, i.e. the documents, their creation and reuse in corporate computer-based systems. Knowledge Asset Management presents a knowledge asset-centric approach which fuses the previous two approaches together. It provides a conceptual framework to guide managers in the planning and development of the initiative and presents a methodology for organisations to: define and document their knowledge management strategy.- audit and design business processes that enhance and facilitate corporate learning.- facilitate knowledge sharing between people in the organisation.- measure and evaluate the quality and value of the organisation's intellectual capital. The book also introduces a way for developing an intranet-based environment to support: the collection and classification of internal and external information.- reuse of stored knowledge using flexible and customisable knowledge navigators and advanced search mechanisms including keyword and concept-based searching (e.g. visualization of the information space).- collaboration via on-line workspaces. Knowledge Asset Management gives an in-depth look at the technologies and methodologies required for knowledge management. The book provides a conceptual framework to guide managers in the planning and development of the initiative and presents a methodology for organizations. Published by Springer-Verlag London Limited 2003.